The Internet is transforming the experience of reading and learning-through-reading. Is this transformation effecting a radical change in reading processes as readers synthesize understandings from fragments across multiple texts? Or, conversely, is the Internet merely a new place to use the same reading skills and processes developed through experience with traditional print-based media? Are the changes in reading processes a matter of degree, or are they fundamentally new? And if so, how must reading theory, research, and instruction adjust? This volume brings together distinguished experts from the fields of reading research, teacher education, educational psychology, cognitive science, rhetoric and composition, digital humanities, and educational technology to address these questions. Every question is not answered in every chapter. How could they be? But every contributor has many thoughtful things to say about a subset of these important questions. Together, they add up to a comprehensive response to the issues the field faces as it approaches what may well be—or not —a crossroads. 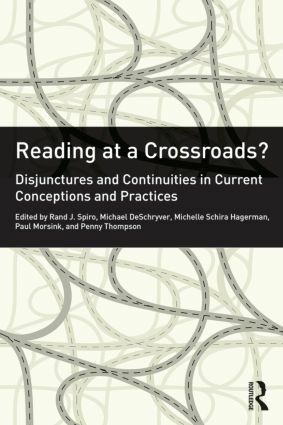 A website devoted to extending discussion around the book in creative (and disjunctive) ways [readingatacrossroads.net] moves it beyond the printed page. Rand J. Spiro is Professor of Educational Psychology and Educational Technology, Michigan State University, USA. Michael DeSchryver is Assistant Professor in the Department of Teacher Education and Professional Development, Central Michigan University, USA. Michelle Schira Hagerman is Director of Graduate Certificate Programs in Educational Technology and Online Teaching and Learning, Michigan State University, USA. Paul M. Morsink is a doctoral candidate in Educational Psychology and Educational Technology, Michigan State University, USA. Penny Thompson is Assistant Professor of Educational Technology, Oklahoma State University, USA.